The third edition of The Huddle, ‘The Hindu’s’ two-day annual thought conclave, concluded at the ITC Gardenia hotel in Bengaluru on February 10. The Leader of the Opposition Mahinda Rajapaksa and several other Sri Lankan Parliamentarians was also present on this occasion. The Indian Vice-President Venkaiah Naidu delivered the Chief Guest’s address at the conclave. 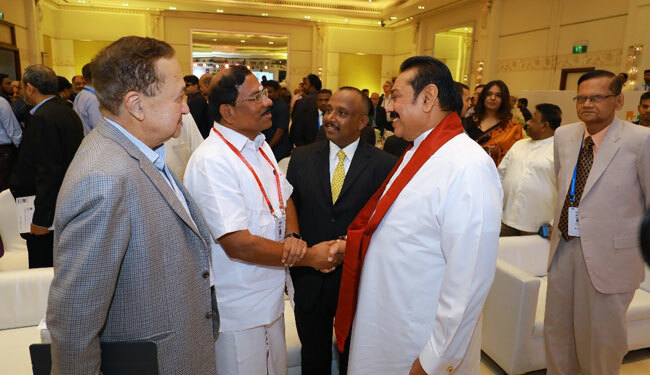 Following the address, Rajapaksa held a cordial conversation along with the Indian Vice President Naidu. Meanwhile, the Opposition Leader met with the Deputy Chief Minister of Karnataka, Dr. G. Parameshwara, yesterday (09). He had also held discussions with the former Prime Minister of India H. D. Deve Gowda, on the current political situation of Sri Lanka.